Darth Vader is a character from the Star Wars universe. He appears for the first time in A New Hope. Vader is the main character of the Dark Side of the Star Wars series. He appears as a 2 meter-tall man dressed in black armor and a cape. His face is covered with a mask, which has a helmet on top. He has borderline personality disorder. Born as Anakin Skywalker, a slave on the desert planet Tatooine who became a Jedi. As an adult, he secretly marries Padmé Amidala. However, he is converted by Palpatine in order to save his wife from her impending death during childbirth. In order to do that, he learns the ways of the Dark Side of the Force, so defying his long-time friend and master Obi-Wan Kenobi. He battled Kenobi on the volcanic planet of Mustafar, but not before choking his wife with his Force Choke due to rage and misunderstanding. The battle resulted in Kenobi's victory coupled with Skywalker's legs severed and his entire body burnt. He survived and rescued by the newly elected Emperor of the Galactic Empire, Palpatine, and have his body reconstructed with cybernetic parts and his iconic black armor and helmet. Anakin lost the last of his spirit once he learn of his wife's death at his own hand, thus Anakin Skywalker's transformation as Darth Vader has complete, much to Palpatine's delight. During the course of the Galactic Civil War between the Rebel Alliance and the Galactic Empire, Vader played an important role as the Empire's enforcer and the Emperor's second-in-command, particularly the construction of the two Death Stars, the Battle of Yavin, and the Battle of Endor. It was during that period he learnt that he had a son named Luke Skywalker by Boba Fett, and later a daughter named Leia Organa during his final duel with his son. Darth Vader died in Star Wars Episode VI: Return of the Jedi, during the Battle of Endor, when his respiratory system had damaged by the Emperor's Force Lightning in an effort to save his son by throwing him at a power reactor, thus redeeming himself and brought back balance to the Force and ending the civil war. His body and armor were cremated by Luke in Endor. However, his grandson Kylo Ren somehow in possession of Vader's burnt helmet in later time. Darth Vader is one of Star Wars' most iconic character and regarded as the world's most well-known fictional villain. Highly ranked in popularity poll, Darth Vader is the image of evil, hatred, rage and darkness but also a representation of redemption. He is well known by his black armor, cape, helmet, and particularly his raspy breath and deep, low-pitched voice, which often used in different medias as a reference to him. Ralph McQuarrie designed Darth Vader's appearance. Brian Muir sculpted Darth Vader's costume using McQuarrie's design. David Prowse physically portrayed Darth Vader in the original film trilogy. James Earl Jones provided the voice of Darth Vader in the original trilogy and Rogue One. 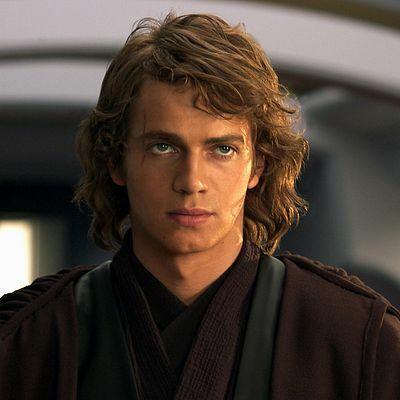 Hayden Christensen as Anakin Skywalker in Revenge of the Sith. According to Mark Hamill, samurai armor was the conceptual inspiration for Darth Vader's appearance. Darth Vader Facts for Kids. Kiddle Encyclopedia.